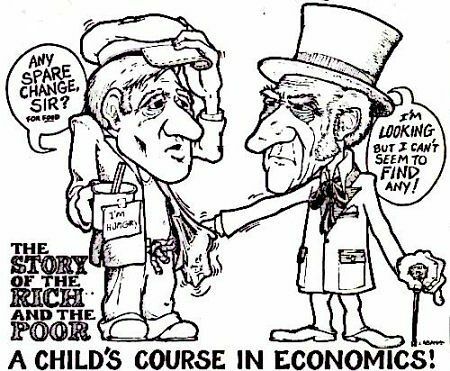 The STORY of the RICH and the POOR--A Child's Course in Economics! -- Or, What's the Matter with the Oil and Money? SO THE RICH HAVE HAD THE SMART OR EDUCATED POOR INVENT SOME NEW MACHINES CALLED "COMPUTERS" TO KEEP TRACK OF ALL THAT MONEY, stocks, bonds, cheques, shares, goods, etc., etc. PRETTY SOON YOU WON'T EVEN HAVE TO CARRY MONEY OR CHEQUES AROUND TO BUY THINGS, BUT JUST A LITTLE NUMBER on a little card that the cashier at the store can stick in a new kind of "cash register." This is a machine they usually put your cash or money or cheques in, but instead of putting your money in it they'll just put your number in it and how much the goods you bought cost or the price. 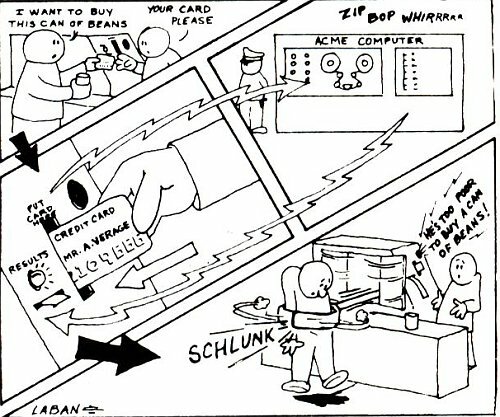 Then this will be automatically taken out of your money at the bank by the computer and transferred electronically on electric wires to the bank account of the store from whom you bought that thing or things and put in the store's bank account of money instead. THIS WAY THEY DON'T EVEN HAVE TO MOVE THE CHEQUES OR ACTUAL MONEY FROM ONE BANK TO THE OTHER, but you'll just be billed by your bank for what you bought and the stores where you bought these things will be given credit for the money you will have paid out of your bank account. THIS IS CALLED A "CREDIT SYSTEM" AND WILL BE THE NEW WAY OF TRADING or exchanging money and things from person to person by computer. THE MONEY THE POOR ARE PAID IS CALLED "WAGES" for working and growing or making things, or moving and carrying them, or buying and selling them, or exchanging messages by means of communications like the telephone, or performing lots of other kinds of work called "services, because you are their servants doing these things for the rich, like building and painting or fixing their houses or cleaning them or cooking their food or driving their cars or trucks, trains or planes. THE MONEY THE POOR GET FOR DOING THESE THINGS FOR THE RICH IS CALLED "WAGES" OR "SALARIES" OR "PAY" and the ones who do the hardest work with their feet and hands and backs are called "labourers." But the ones who do the head work with their brains to invent and operate these things for the rich are called technicians, engineers, clerks, military officers, managers, brokers, business experts, scientists, builders, etc. ALSO, SINCE THE RICH ARE SO OFTEN SICK BECAUSE OF ALL THEIR MONEY WORRIES OVER THEIR RICHES AND STRUGGLES FOR POWER AND WARS, ETC., THEY NEED DOCTORS AND DRUGS to try to make them well and happy again, which they seldom are since God doesn't bless them for robbing, cheating and oppressing the poor and breaking His laws of love to do it. 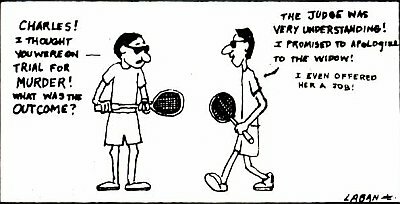 THEY ALSO HAVE SO MANY FIGHTS AND ARGUMENTS AMONGST THEMSELVES THEY HAVE TO HAVE LAWYERS AND COURTS AND JUDGES TO TRY TO SETTLE THEM. They also need military leaders and officers to lead the poor soldiers to fight the wars of the rich with other rich. THE RICH ALSO NEED TEACHERS TO TEACH THEIR OWN CHILDREN HOW TO GET RICH AND STAY RICH and oppress the poor, do business, fight wars, etc., and also they need teachers to train the poor to do their work, invent and operate their machines, perform their services as their servants and conduct their businesses, communications, transportation, governments, wars, etc. 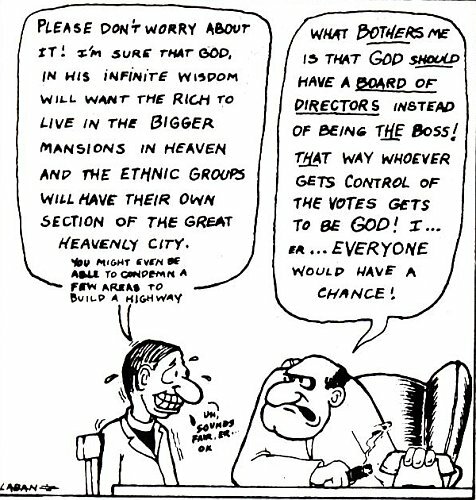 THE RICH ALSO NEED RELIGION AND RICH RELIGIOUS ORGANISATIONS LIKE THE CHURCHES TO TRY TO COMFORT THEMSELVES FOR ALL THE EVIL THEY'VE BEEN DOING and the poor they've been robbing and the wars they've been fighting, and also to subdue the poor and keep them from complaining about their poverty with promises of future Heavenly happiness and to brainwash the poor of any anti-rich ideas and indoctrinate them with complacency and willingness to be peaceful servants to the rich and work hard for them and do all these things for them as the will of God, which to religion, is the will of the rich. SO THE RICH ALSO NEED THE CLERGY OR PREACHERS AND PRIESTS AND CHURCHES TO KEEP THE POOR PEACEFUL AND WILLING WORKERS. all these smarter, better educated, better trained servants of the rich who do this head work more than hand work are called "white collar," workers, "professionals" or the "middle class" who make more money and are paid more than the poor hand-working, hard-working so-called "blue collar" ordinary labourers who do the manual, menial tasks and even work for the middle class too. 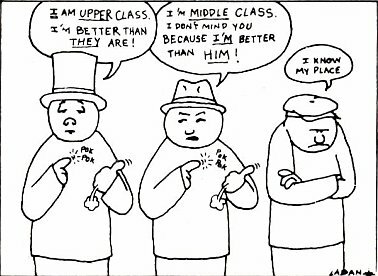 THIS "MIDDLE CLASS" OF PROFESSIONALS AND TECHNICIANS AND SMALLER BUSINESSMEN, DOCTORS, LAWYERS, TEACHERS, PREACHERS, BROKERS, CLERKS, ENGINEERS, ETC., are not only paid and allowed to make more money than the poor but are also allowed to own more things like finer houses, better cars, colour TVs, hi-fi's, nicer clothes and eat more and better food, etc., to try to keep them happy so they won't rebel against the rich whom they serve, even though they're smart enough to do so. 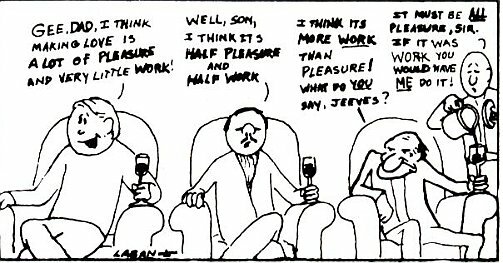 THIS PARTLY RICH MIDDLE CLASS OF WORKERS, scientists, technicians, professionals, etc., because they are so well paid and given so many things and allowed to live so comfortably, they help the rich to keep the poor in their place on the bottom so they won't rebel against being slaves of the rich, as they are also the slaves of the middle class who are a sort of semi-rich or half-rich known as the "bourgeoisie" or "intelligentsia," intellectuals, professionals, small businessmen, etc. THIS HALF-RICH MIDDLE CLASS ARE ALL THE SAME AS THE VERY RICH TO MOST OF THE VERY POOR of the world, since the middle class is rich compared to the poor. So that the slightly richer middle class and the very rich upper class who govern them are all the same to the very poor who serve them as their servants and slaving labourers. TO THE POOR MAN WHO IS TRYING TO EARN ENOUGH TO GET ENOUGH FOOD, CLOTHING AND SHELTER TOGETHER to keep the body and spirit of himself and his family together and alive, the rich and the middle class are all the same--they are all his masters and he their slave. THE POLICE AND ARMY TOO LOOK TO HIM LIKE NOTHING BUT THE TOOLS OF THE RICH AND MIDDLE CLASS who make the laws and enforce them to protect themselves and keep him under and in subjection so he can't rebel or riot or revolt for his rights or strike for higher wages or demand better housing and living conditions or more food and better clothing. SO THAT THE COURTS AND PRISONS ARE NATURALLY LOADED AND FILLED TO OVERFLOWING WITH MANY MORE OF THE POOR and very few of the middle class and almost none of the very rich who, after all, are themselves the government and the law and its enforcers and are always excused or buy their way out even if they do happen to run into trouble with the lower classes for robbing or cheating them or even killing them.